The waves roared as the ship wafted through the coastal seas. Everyone had their eyes fixed on the coast. The lookout confirmed that we had no visual yet. I took out me own glass and studied the coast. We were on the right co ordinates but could not spot our destination. Then someone shouted that a restaurant had been sighted on the other side. We were looking at the wrong side. Upon moving to the port side, we immediately saw our destination. I removed my looking glass and smiled. "Time to give this salty episode a happy ending lads, its grub time." So lets be honest, what does one expect when they hear Gurukripa as a name? They expect a traditional South Indian fare in a simplistic Udupi style setting. Did you judge this book by its cover? Shame on ya. Assumptions are always bad. Sometimes, life gives you a lot better than you expected. Despite being on the main road, Gurukripa is a difficult to spot gem. So lets call it a "not quite so hidden but difficult to spot" Gem. Geez, I guess hidden gem sounds easier. The place has both an Al Fresco and an indoor area. However, one would be crazy to sit outside in the sweltering summers of Mumbai. I had come here with a small group of friends with similar food interests. We figured that as a group we could experience more of the menu than one person could. So there we sat around the dining table like the Avengers around a conference table deciding what to eat. 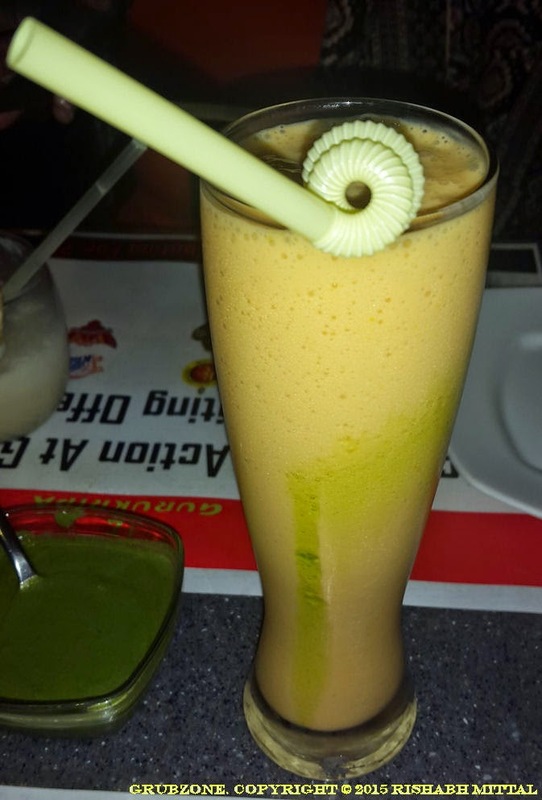 Gurukripa leaves the stereotype of the typical Udupi restaurants down in the dust. It has a classy ambiance with artistically finished walls. The indoors are further divided into a main area and three private rooms upstairs on the mezzanine floor. The main area has a typical restropub feel to it and feels real cozy. There is a proper bar counter with an experienced bartender as well. Methinks, it lived well up to its name, Gurukripa (God's Grace). At the time of our visit, the restaurants ambiance had been given a festive touch with IPL merchandise all over. In fact, there were even live sized cut outs of players at the door. I am told that the ambiance looks even more classy at dinner time. And the pictures certainly attest to that. With a little chatter and banter, the group decided to have some grog and appetizers. 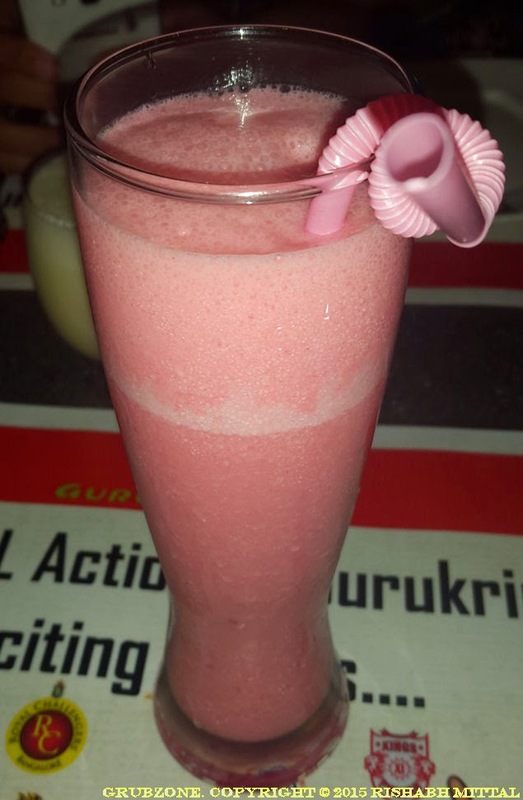 Strawberry Punch - Was a strawberry drink which bordered somewhere between a smoothie and a milkshake. The taste was rich and had a natural tang to it which made it well worthy of being called a Punch. Punch your senses up to a new high...wait that sounds wrong. Captain : Sweet and thick. Crewmate : Tangy and smooth. Captain. Yes...Hey wait ! Did you take a sip of me drink? Mango Blossom was very much similar to my drink. Just remove strawberry and add Mango. The consistency and the milkiness were similar. It did have a very summer like aroma to it which kind of explains why its called Blossom. Virgin Pinacolada was surprisingly good. Here I thought that without the rum it would lose its typical flavor but the mixer did a great job retaining the flavor sans the alcohol. This goes on to show that a good bartender can perform well in any conditions. It also tells me that I forgot my own wisdom nut about assumptions a few paragraphs above. 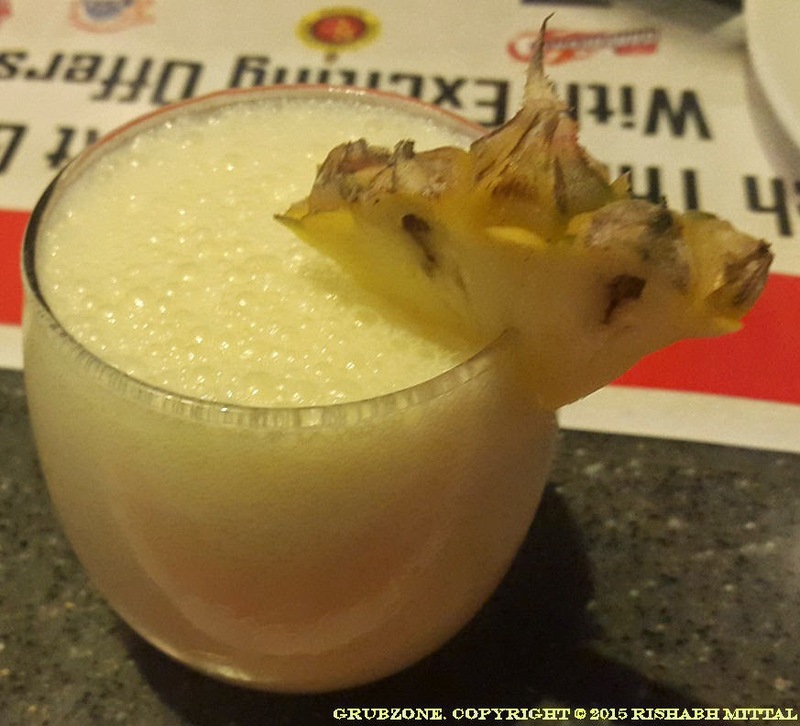 To Conclude, I feel that Gurukripa is quite a great place to get your grog fix. Moving on to the appetizers. Grilled Chicken with Black Pepper - This was a tasty snack with lightly moist chicken and an essence of pepper. Could be quite addicting and you may forget that you have to eat mains later. It was quite aromatic and well plated. As an improvement, the spice quotient could very well have been a bit higher. 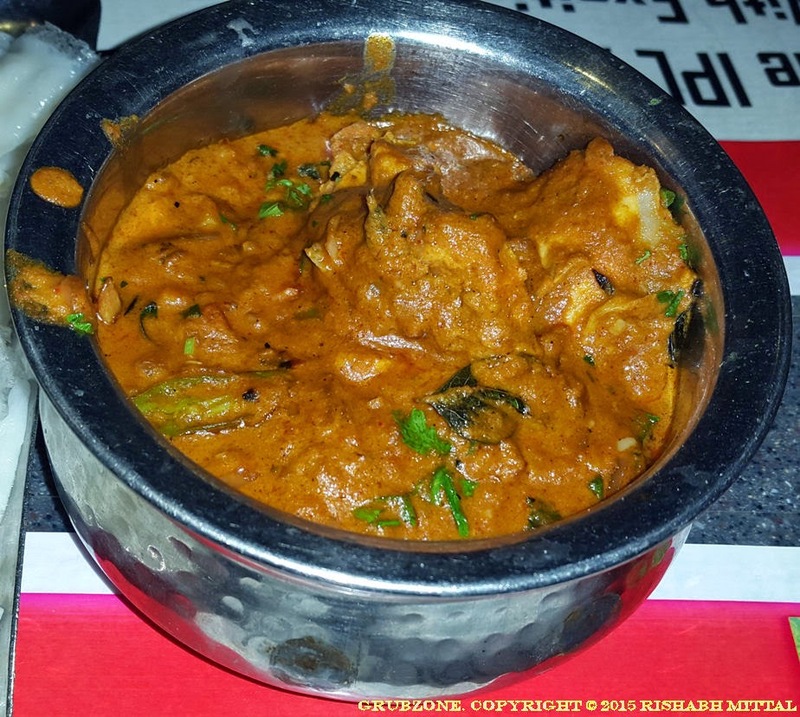 Chicken Ghee Roast is a true hidden gem within Manglorean cuisine. Its not something that one would find in many places within Mumbai. Unless you are traveling to Mangalore, have this in Mumbai right here at Gurukripa. This was a well marinated and roasted chicken. It was then coated with ghee and spices. This was my first time with this dish. Spicy, tangy and savory at the same time like a tricolor of tastes that tease your taste buds. If you are a carnivore then this dish is an absolute must. In fact if you are a dish trailblazer, a trip to Gurukripa just for this is well worth the effort. Captain : I never knew you could make such a tasty thing with good ol ghee. Crewmate : This is like a sea of flavors. Captain : And we are on a quest to find them all. Crunchy Mushrooms was a fried snack made out of Mushroom caps and cheese stuffing. They were plated excellently in a manner that made them more appetizing. Mushrooms have been overused for stuffing around the world but some people just do it better. The deep fried batter encasing the Mushroom gave it an unexpected but welcome crunchiness. I am a big fan of creativity and I loved what they did with this dish here. Filled with my share of appetizers, I moved to the mains. Just a few years ago, I won't have known what a Neer Dosa is. But with the expansion of South Indian cuisine within Mumbai itself, it was a matter of time before Neer Dosa became mainstream. Its like you suddenly discover after a whole life of eating brown chocolates that white chocolates exist too. But if that was not enough, you also discover that the white chocolates that you have had so far were all an imitation. Sad story indeed. 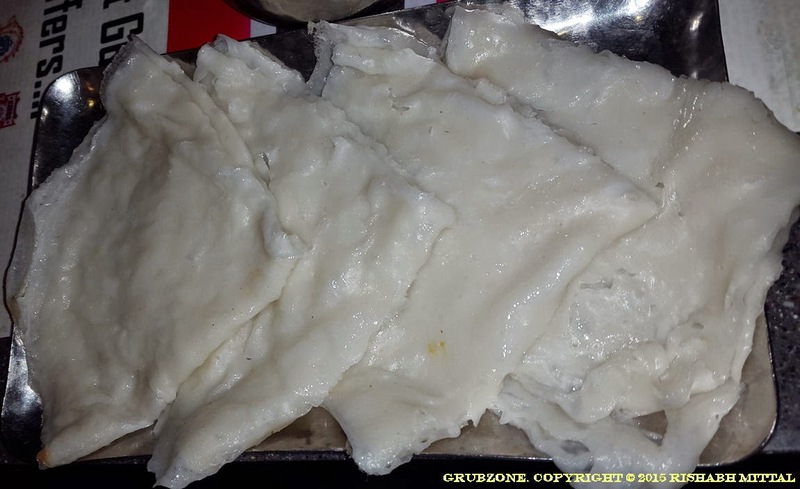 These Neer dosas or rice batter dosas were soft melt in your mouth types. They had a shiny appearance which made them appear a tad bit oily but I felt that this was an optical illusion. Captain : What if I told you that lentil brown dosas are not the only ones in existence? Crewmate : Then, I would ask you to stop playing your Morpheus routine with me. 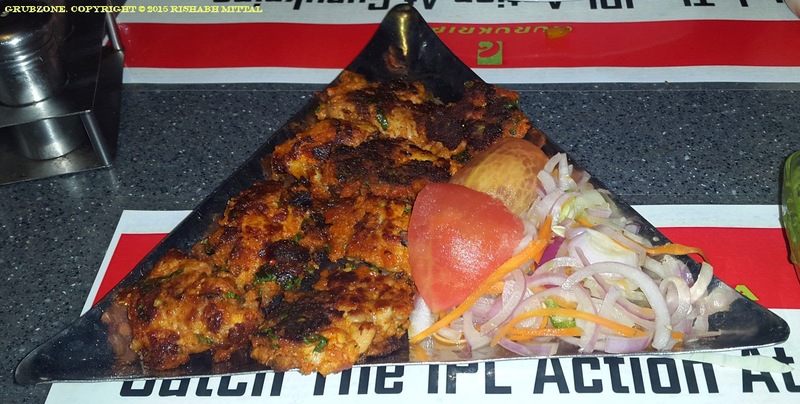 Chicken Malwani is an excellent coastal dish which I have had in many places before. Surprisingly, each place had its own variation with a basic underlying taste. Gurukripa's variant was succulent and decent. But I felt that the chef should have added spice to the gravy for flavoring rather than adding chopped green chillies separately from the top. This caused a slight off beat flavor which felt alien to the dish's central theme. Nonetheless, it went great with the Neer Dosa. I would like to thank our server Rajendra for recommending this excellent combination. 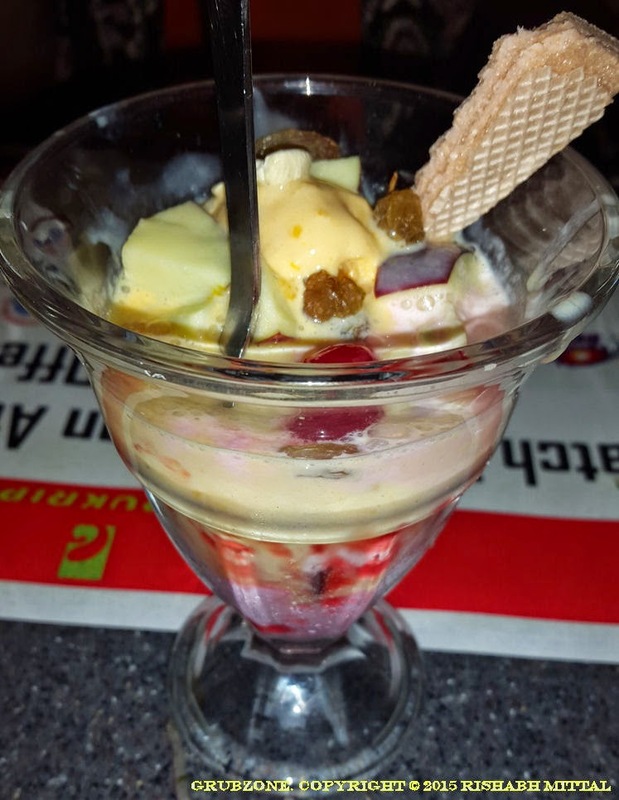 Gadbad is an Indian Sundae that is found in many Mumbai eateries. Usually treated as a haphazard mixture, it seems to have lost his sheen over the decades. However, Gurukripa revives the old favorite with its own touch. It is made with Vanilla , Mango and a hint of strawberry ice cream. And added to it is an assortment of local tropical fruits. The jelly at the lowest level provided both flavor and aesthetic beauty to this concoction. Topped with raisins and a wafer biscuit, it was made to please both the eyes and the tongue. Dive your spoon into this sweet sea of sundaeness and treat yourself to a truly divine dessert. Captain : Deep within the sea of ice cream lies the fabled red jelly. Crewmate : But as you travel towards the bottom you also find semi sunken treasures in fruity forms. Captain : And as you rise back to the top, you see a magnificent wafer standing grand like a lighthouse. Crewmate : I reckon that we both should be high on dessert at the same time Cappy. The service was excellent and it was nice to know a server who was well informed on the menu. Our group felt like a bunch of lost musicians who desperately needed a conductor. Our server Rajendra fit well into that role guiding us with the house specials and flavor combinations. Gurukripa's pricing could be slightly more than the traditional Udupi joints but then it also provides a superior standard. Its pricing I feel is equivalent to most North Indian/Mughlai type restaurants in Mumbai. I did feel however that the non alcholic drinks were expensive in comparison to other restropubs. In terms of the whole experience, I feel the prices do well. To wrap this up, I will say that Gurukripa is definitely one of the better South Indian eateries in Mumbai. 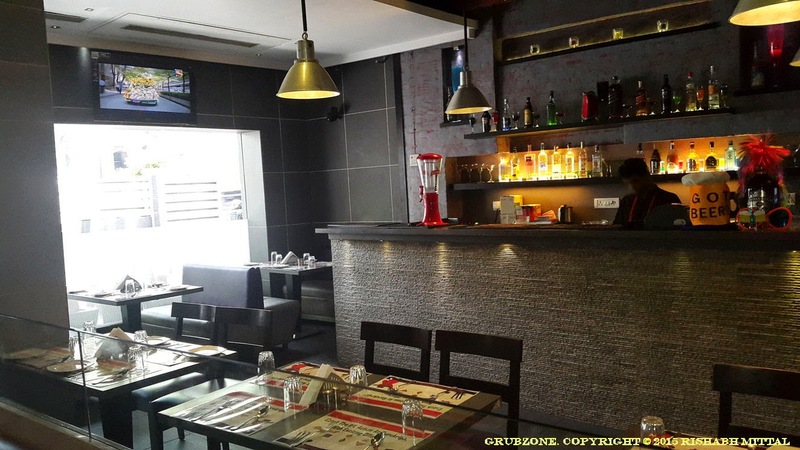 Its humble name may put off stylish connoisseurs but if you are one for the food then march straight away to dine at Gurukripa. "All right lads, the ship wont sail by itself. Time to raise the anchor and venture back into the ocean's mist."